FINALLY! WE HAVE JUST PROCURED A SMALL SUPPLY OF THIS GREAT COFFEE. IT IS ONLY AVAILABLE IN 8OZ AND 1 LB SIZES. PLACE YOUR ORDER NOW WHILE WE HAVE IT AVAILABLE! 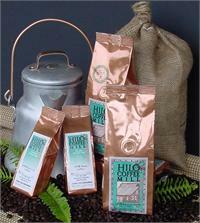 Award winning Ka'u coffee is a high-grown Hawaiian coffee. 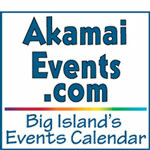 On the slopes of Mauna Loa where the mornings and evenings are crisp and the afternoons warm. Perfect growing conditions for one of the world's best coffees. We recommend a Medium but it is also great in an Italian Roast! 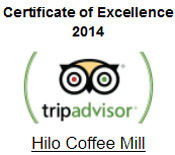 As with all of our Hawaiian coffees, it is completely pesticide free! This Coffee is Sooooo Good !!! I guess the rating guide does not keep the Five Stars up on the board so that you can see them. However , I rate this blend and other blends of coffee that the Hilo Coffee Mill has a 5+. Its a shame they dont rate on a scale of 10 , I'd give it a hundred. You will regret not buying this blend. It is Fantastic !!! Very aromatic and tasteful. We love it , and you will too. Aloha and Mahalo to the wonderful people of the Hilo Coffe Mill. Your coffee is the life blood of my buisness. I live on the Big Island where I can get any coffee I like and this is the one I pick hands down. I am quite a coffee lover and really picky. This coffee has a really rich taste without knocking you over. If you are going to try one of these coffees I recommend you start with this one.